You are key to building strong, healthy, & sustainable communities for all! 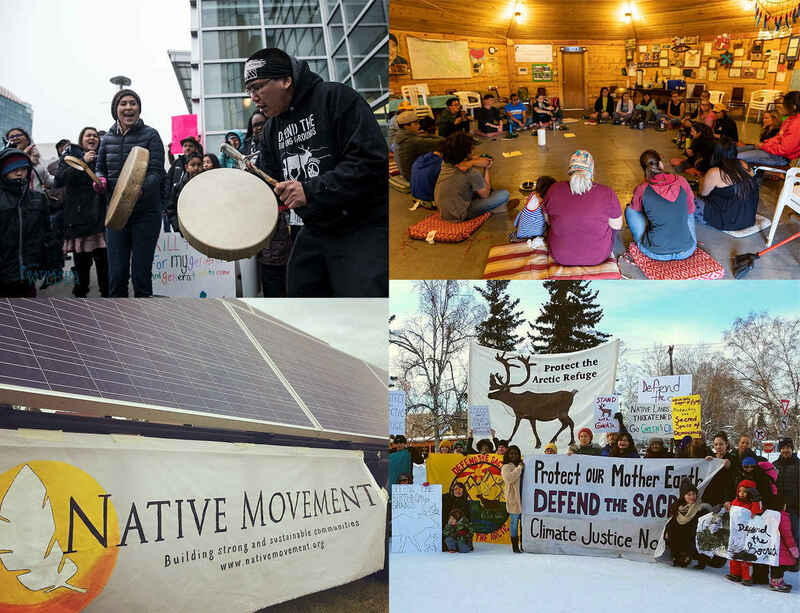 Native Movement provides key support to grassroots-led projects. Supporting Native Movement Overall ensures the continuation of our programs and projects as well as all our sponsored projects. Thank you! Native Movement has hosted numerous community organizing trainings, reaching hundreds of Alaskans. We have stood firm in the work to protect Indigenous rights and the rights of Mother Earth, particularly around the fight to protect the Arctic National Wildlife Refuge and Alaska's coastal zones and oceans. And Native Movement has been key in building the momentum of an Alaska Just Transition dialogue building toward a fair and equitable "new" economy. While we have made waves throughout Alaska, the road ahead has many challenges. There is no doubt that these are times of huge uncertainty. Native Movement knows that change is inevitable and we are committed to continuing to be a guiding light on the path of justice. Mahsi' choo, Quyanaq, Tsin'an, Enaa Basee', Anaá Maseé, Gunalchéesh, Ahé hee' - Thank you for helping us build this movement! We welcome you to visit our offices (Fairbanks and soon Anchorage! ), meet our Native Movement family, and dig your hands into shaping the movement with us! If you would like to donate to a specific project or to a specific Native Movement supported organization please write that project/organization in the memo line, example: "For BMWC" or "For FCAC"
Donation for Decolonization training in Anchorage, thank you so much. I'm so proud of your radical work/leadership & grateful for all y'all do - thank you. Thank you for doing the work and speaking truth to power! Y'all are the best. Supporting Native voices are key to winning the struggle against the environmental pillaging of capitalism. I'm happy to donate in support of Defend the Sacred Alaska. Decolonization Training in Anchorage. Thanks!